Preheat the oven to 275 degrees. In a large bowl, add the dry ingredients and mix thoroughly. Whisk together the wet ingredients in a small bowl and add it to the dry ingredients. Mix until everything is moist and large clumps form. Spread the granola mixture across a sheet cake pan and place in the oven for 30 minutes, then stir gently and continue to cook for another 30 minutes, or until the granola starts to brown but is still slightly soft. 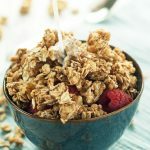 Remove the granola from the oven and allow to cool completely, for at least an hour, so the granola can harden into clusters. Break apart with a spoon and store in an air-tight container.